Really regret not booking flower power when some good rooms were available, but all suites were sold out the first week. Nice to see you on board Cary and George. We've also sailed the Infinity on a couple of occasions but not on a theme cruise. She is one of our favorites, but the 60s and 70s cruises on any ship would likely be great as they are not like any other. We've done the Flower Power 60s cruise twice and it was totally groovy. Mingled with the artists, live music from 11 a.m. to bed time, nightly pool parties, costume nights, Q & A sessions with the artists, dancing, dancing, dancing and more. We are also doing a b2b on the 60s cruise which follows this one. 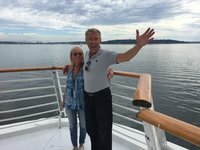 Welcome George and Cary , we booked the 4 day cruise before this cruise to extend this vacation, 60’s flowerpower which is after this is sold out, we just saw Micheal McDonald in Dallas he was great on rock and romance last March. We booked this quite some time ago & glad to find this thread! I’m retired Houston PD & the wife a retired school teacher plus we’ll be traveling with another couple. This will be our 2nd sail on the Infinity. Looks like it’s almost a sellout. You probably received the SV email ensuring fans that Boz Scaggs would be performing on March 27 but his name can't be in their marketing material due to advertising conflicts.